Few of us were born knowing the ways of bluegrass jamming. Many of us learned the hard way—by being jambusters. Usually no one tells us explicitly what we’ve done wrong, but we kind of get the idea and then we are a little embarrassed. But we come back because it’s so much fun and everyone is very nice. Maybe at one point we Google “bluegrass jamming” and find something by Pete Wernick on Dr. Banjo’s site or the Etiquette page on The Handsome Ladies site and daylight dawns over Marblehead, as we say in eastern Massachusetts. 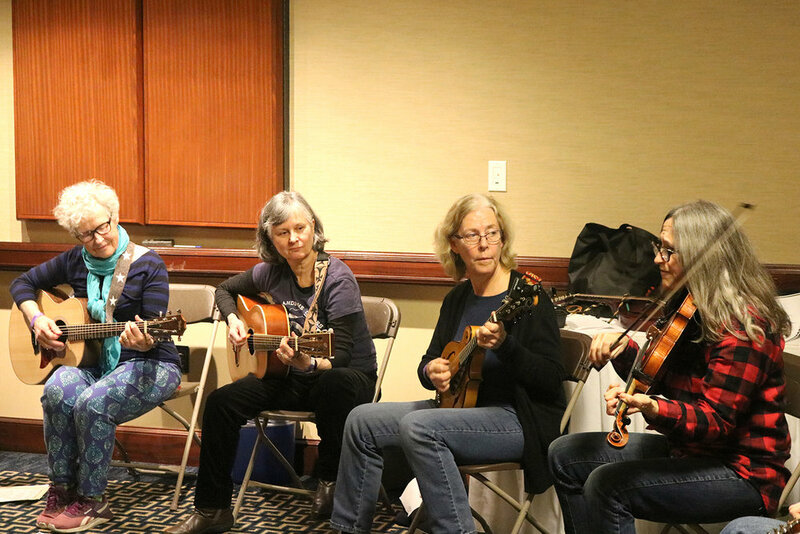 The Handsome Ladies of the Boston area conducted a Workshop Jam at the Joe Val Bluegrass Festival, in part because our jam at JamVember attracted quite a few people who were new to the concept. We figured, although none of us have been to Harvard, except to busk, that we were qualified to do some educating. But no one wanted to sit up front and lecture. So we decided to do a Jam Buster skit, to illustrate how to do bluegrass jamming wrong. The following is our script, with the swearing edited out. At the end of the script is a key to the Buster moves and a list of others not covered. By the way, when the skit was over we had a fun jam! Cindy [looking at Colleen]: What on earth is that?! Colleen: Oops! I forgot to tune. Fran: Give her the Buster hat! Cindy: That’s all I know. Does anyone else know this song? Gwen: Pancho and Lefty is not even a bluegrass song! I’ve got a bluegrass song. How about Moonshiner. It’s in D, just 1, 4, 5. The first and last line are the same, they go 1, 4, 1 5, but in the middle it goes 1 5 1 …..
Gwen: Okay, I know. Let’s do Jambalaya. In G. Very easy, two chords, just the 1 and the 5. Gwen: What are you doing? Colleen: I’d like to do Blue Ridge Cabin Home. I have music for everyone. [Starts handing out papers, the rest of us mutter and grumble. She pulls around a chair and puts her paper on it. Bends over it and starts playing and singing. We try to follow. She gets to the end of the first chorus, starts playing over the verse, then looks up surprised no one is taking a break.] Who wants to do a solo? Buster moves, from the top. 1. Being out of tune. 2. Calling a song you don’t know. 4. Playing percussion. 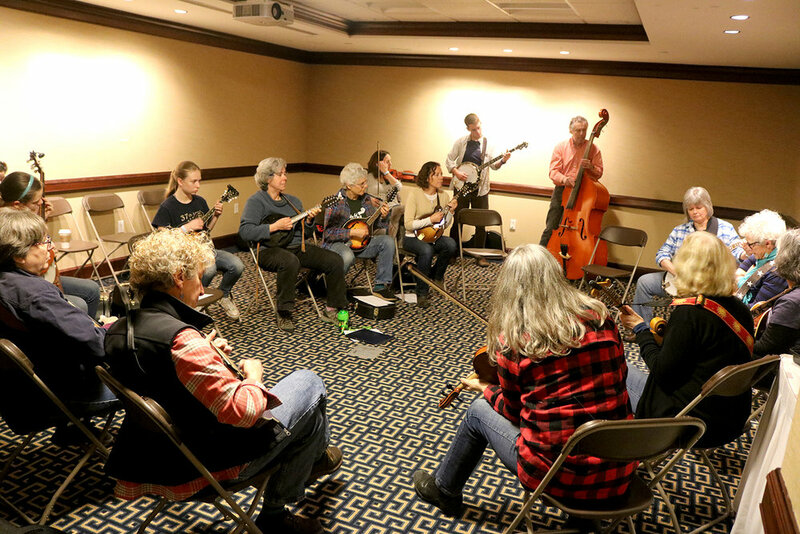 A traditional bluegrass jam should uphold the expectations of the tradition. Arguments can and are made that Bill Monroe’s early band had Sally Ann Forrester on the accordion, but the band that defined bluegrass had five instruments: mandolin, banjo, guitar, fiddle, and bass. Individual jams may vary, but be wary of being *that* individual. 6. Leading from sheet music (iPhone, etc. ), especially if doing so keeps you from managing breaks. A jam should be where you bring your polished materials and push yourself free of the training wheels. 7. Treating a jam like a performance. The business at hand is playing music together. 1. Playing too loud against singer or solos. 3. Failing to notice that only harmony singers join the chorus in the jam you are in. 4. Not keeping eye contact with the leader to accept or decline breaks. 5. As leader, failing to make eye contact with players and offer breaks. 6. Talking too much, especially about politics or showing off what you know about music. 7. Showing off. A jam is a collaborative effort to make music, not a performance (bears repeating). 8. Not keeping tempo (not listening to other players).